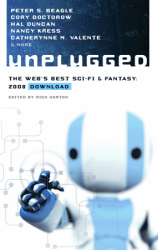 "Unplugged aims to showcase the online fiction often neglected in standard best-of-the-year anthologies, and a rousing success it is, containing, among other things, Merrie Haskell’s genuinely delightful tale about a girl-prince who, over her parents’ objections, undertakes a risky journey to rescue a princess held in a tower that has brought to ruin many princes before her; she rescues quite a few people. Also prime delightful is the eerie “The Things That Make Us Weak and Strange Get Engineered Away,” one of Cory Doctorow’s more unnerving forays into the short story. The selections come from a truly excellent assortment of venues, including Tor.com, Lone Star Stories, Baen’s Universe, and Farrago’s Wainscot. They constitute a shining example of the good general anthology. Clearly, selecting only online stories imposed no limit on scope, variety, and high quality." Online stories are read differently than print? 1. Should stories for online markets be tailored differently than stories for print? 2. Should all SF/Fantasy Mags go to E-Submissions? Time for a poll. Yes, I know doing an online poll is going to have a bias… but the original conversation is online, so what the heck. The latest addition to our online fiction area is halspacejock‘s story, Loss Leader. It was originally published in Andromeda Spaceways Inflight Magazine issue #3. Speaking of which, two new issues arrived today. Kushiel’s Scion and Fistful of Charms have been out for a few weeks, but since these copies ere being signed, they’ve just started shipping last week. Phantom was supposed to be issued signed by the publisher, but (probably due to Terry’s health) that edition was cancelled. I had a lot of disappointed customers on that one. The free fiction on our site seems to be drawing a lot of attention in the first 24 hours. This is definitely something I plan to continue. Next up will be a couple of stories from Andromeda Spaceways Inflight Magazine. Glad to have Talebones showing in the magazine list. Good news there is that the subscription drive has been a success and they will continue publishing. Fantasy Magazine slipped to #2 this week, but it stands a good chance to take back that spot next week.